Now that the weather seems to have settled down a little I can safely think about doing a “Spring” update here. We’ve had a bit of everything from the weather over the last week or so – snow, hail, rain, sun, cloud – but the forecast for the week ahead seems to show a more appropriate rise in temperatures coming. After the novel experience of calving over the winter, the routine for the cattle has settled back into something more normal. We still need to book a visit from the vet in due course to deal with the castration of the second calf. It just wasn’t possible to do this as we had planned at about 1 month old but on the plus side this calf was born without horn buds so there was no disbudding needed! They are now getting a little fed up with the feed we give them and are eager for any scraps of fresh grass they can get at. 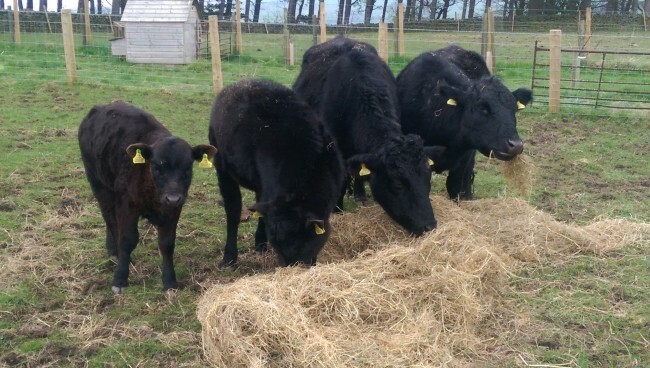 A couple of bags of lawn grass cuttings were happily munched last week but I’m told by others that this is not a good idea because the cows will start noisily demanding more even when we aren’t cutting the lawn! Yet again we’re already well into the “egg hunting” season with one or more of the white chickens deciding to sneak off and find a quiet spot to lay in the woods. It can be frustrating to search high and low but find nothing and then suddenly find a clutch of 8-10 eggs under a well hidden hen. As for chicken numbers, we have 10 white ones (including a cockerel) that were mostly hatched in our first year here. 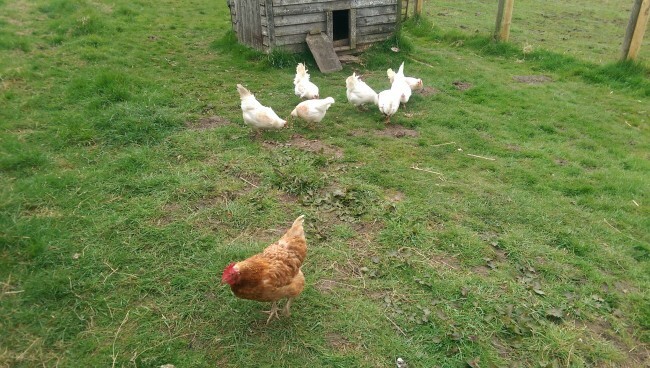 We also have just remaining one brown chicken – an ex-battery hen – who seems unphased by being the odd one out and is usually happiest wandering around with a single white chicken for company. 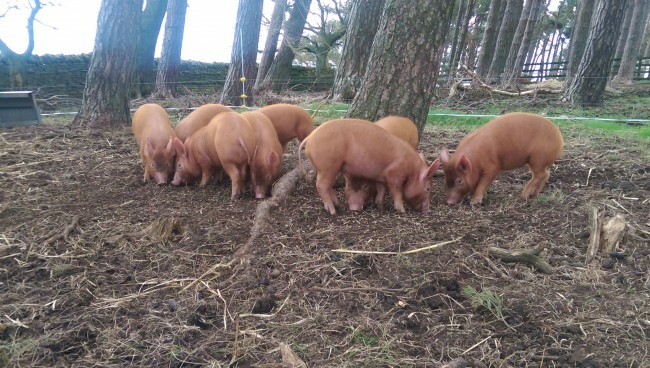 The pigs seem to be really enjoying their time in the woods and our two sows have done an excellent job of raising their respective litters. It’s been quite an eye-opening experience to have this many mouths to feed and to see how quickly they can get through the pig feed. A definite plan for the future is to look into other alternative sources of feed for the pigs. 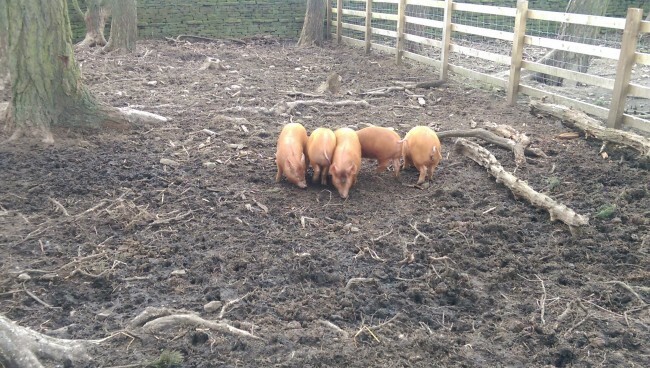 We can get occasional waste fruit and vegetables from a local shop but this number of pigs get through a lot of feed and we need to keep up a good balanced diet to sustain decent growth rates and to maintain their general good health.